Charlie Chaplin was a British-American entertainer, perhaps the best known character of the silent film era. He had an interesting chart with a dynamic Sun in Aries and a very close Moon / Ascendant conjunction in Scorpio. It was the chart of a tenacious and independent self made man who was first on stage at the age of 5. He had a troubled childhood, his mother was in and out of institutions with physical and emotional problems and his father was an alcoholic who could not care for him so Charlie was placed in children’s homes and workhouses. A young career on the stage was Charlie’s way of looking after himself. A very odd thing about his chart is its similarity to one belonging to a figure that he famously satirised on film, Adolf Hitler. Hitler was born 4 days later but again around sunset so all the planets apart from the Moon are in quite similar positions. The differences are small but important. Chaplin’s Sun is at the end of Aries and Hitler’s at the beginning of Taurus. Taureans are generally politically conservative, whereas Ariens can be quite radical always seeing a need for action. Hitler’s Moon is in the reactionary Capricorn whereas Chaplin’s Moon in Scorpio can be very rebellious. Hitler’s Moon is in exact conjunction to Jupiter which allows him to play out his right wing views on a vast scale. But the strongest indication of the intensity of the German dictator’s life is found in the exact opposition between his Sun and the Ascendant. 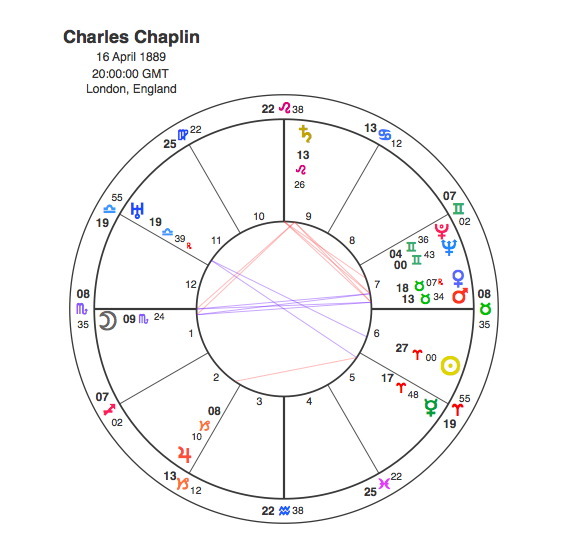 For both of them, Pluto’s square to their Sun marked the peak of the careers, Chaplin’s in 1935 – 37 with the film Modern Times and Hitler’s from 1939 – 40 with the beginning of the 2nd World War. But these career peaks presaged a fair speedy descent as the most difficult time in the careers was the same. For Adolf Hitler the tide turned in 1942 after the disastrous attempt to open a war on two fronts with Russia and the US entering the conflict. As we all know he committed suicide in 1945. In 1943 Joan Barry, an actress who had an affair with Chaplin announced that she was pregnant with his child and filed a paternity suit against him. The director of the FBI, J. Edgar Hoover, who had long been suspicious of Chaplin’s political leanings, used the opportunity to generate negative publicity around him and named him in four indictments related to the Barry case. Most serious of these was an alleged violation of the Mann Act, which prohibits the transportation of women across state boundaries for sexual purposes. even though Chaplin was acquitted it was still called the “biggest public relations scandal since the Fatty Arbuckle murder trial in 1921.” Media coverage of the paternity suit was influenced by the FBI, and Chaplin was portrayed in an very critical light. Chaplin’s left wing views were evident during World War II, when he campaigned for the opening of a Second Front to help the Soviet Union. The FBI wanted him out of the country and early in 1947 they launched an official investigation. Chaplin denied being a communist, instead calling himself a “peace monger”, but felt the government’s effort to suppress the ideology was an unacceptable infringement of civil liberties. Unwilling to be quiet about the issue, he openly protested the trials of Communist Party members and the activities of the House Un-American Activities Committee. As his activities were widely reported in the press, and Cold War fears grew, questions were raised over his failure to take American citizenship and there were many calls for him to be deported. His career never really recovered and he spent the last 25 years of his life exiled from the US. The period from 1943 – 48 coincided with Pluto’s appearance in his T square, square to the Moon / Ascendant conjunction, conjunct Saturn and square Mars. Chaplin’s Moon / Ascendant conjunction in Scorpio is an interesting symbol. The Ascendant in the chart is about the image that we present to the world and in an actors chart it can say a lot about the kind of roles that they play. The Moon is an entity that has no light of its own, it merely reflects the light of the Sun. So someone with the Moon closely conjunct the Ascendant would be good at reflecting an image or mimicking someone. As the conjunction is in Scorpio it would be fair to say he would be able to mimic characters who had sunk to the lowest levels. This would be appropriate in the case of Hitler but also in other ways for many of Chaplin’s characters, not least the one he was most famous for in the early days, The Tramp. 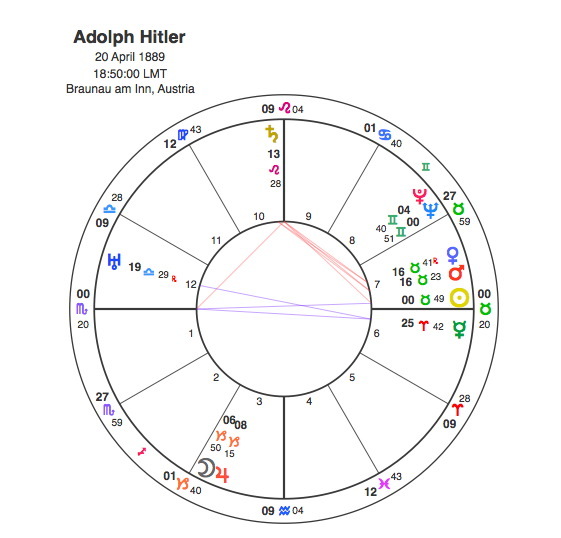 When Pluto was conjunct Hitler’s Sun in 1940 he was waging war but on the other side of the Atlantic ( or the other side of the chart ) Chaplin’s Moon and Ascendant ( which was opposite Hitler’s Sun ) was satirising him in the film ” The Great Dictator “. And what was happening in Chaplin’s chart in 1940 ? He had both Jupiter ( The Great ) and Saturn ( Dictator ) conjunct his Sun.